Nutrition deserves to be at the top of the development to-do list. Here are 5 strategies to help us get there. You’ve heard about climate change but boy … do we have a story for you! That is my take upon reading the world’s first report on the global nutrition crisis, which places nutrition on a par with climate change as one of the highest-stake global development challenges, one we ignore at the planet’s peril. Here’s the knockdown statistic from the Global Nutrition Report: Only two countries in the world achieve public health thresholds for under-five stunting, overweight adults and anemia in women of reproductive age. That’s a fancy way of saying that basically every country in the world is struggling with the problem of poor nutrition. There are few development challenges that can make that claim. These problems of poor nutrition lie at the root of the high rates of early death and disability — particularly among children, pregnant women and new mothers — in many countries. Globally, malnutrition is a major underlying cause of almost half of the 6.3 million child deaths that are occurring each year and is responsible for half of all years lived with disability by children. It is costing governments billions in healthcare costs, lost productivity and economic growth. The Global Nutrition Report makes a compelling case for pushing nutrition to top of the global development to-do list, but that won’t happen without a dramatic increase in the political power that nutrition stakeholders wield. To build the influence needed to give the report a shot at the impact it deserves to have, here are five strategies worth considering. The draft Sustainable Development Goals aim to “end” hunger and all forms of malnutrition by 2030 and achieve the World Health Assembly targets of a 40% reduction in child stunting, a 50% reduction in anemia among women aged 15-49, a 30% reduction in low birth weight babies, a 5% ceiling on the proportion of children who are wasted and a freeze on the number of overweight children under five. The targets also aim to increase the global rate of exclusive breastfeeding to 50%. We’ve learned this much from the Millennium Development Goal era — indicators are everything, because it’s ultimately the indicators and not the goals that shape investments and drive performance by all development partners. At the very minimum we need to see the World Health Assembly nutrition targets as specific indicators in the Sustainable Development Goals so that all stakeholders can measure progress against these goals and be held accountable for their achievement. At the same time, we may also need more ambitious targets in a few areas. For example, when WHO acknowledges that exclusive breastfeeding has the single largest impact on child mortality of any preventive intervention, is a 50% target ambitious enough? Most of the countries that have reduced child deaths by two-thirds and achieved Millennium Development Goal 4 have exclusive breastfeeding rates above 50%. Further, when we know that breastfeeding within an hour of birth can significantly reduce newborn deaths, why can’t we have a specific target for early breastfeeding initiation of 60 or even 70%? This alone could set the stage for a mass mobilization of maternity facilities all around the world to work harder to help women initiate breastfeeding right after delivery. When the Global Nutrition Report estimates that 70% of the recent reduction in childhood stunting in a country like Bangladesh is due to advances in education, incomes, sanitation and contraception, it means that nutrition needs to put down deep policy development, program design and service delivery roots in sectors other than health. The recent work by GAIN and Alive & Thrive to encourage large employers of young women in Viet Nam and Bangladesh to educate women about nutrition, provide nutritious foods and breastfeeding support at work is one example of how to pursue opportunities outside the health sector, but we need many more. Within the health sector there are also many opportunities for integration. Why are so many vaccines being delivered, often door to door in the case of polio, without a nutrition component? When we talk about integrated Community Case Management (iCCM) of the three major childhood illnesses — pneumonia, malaria and diarrhea — why is nutrition left out? And why are so many malaria campaigns (e.g. bed nets and seasonal malaria chemoprevention) happening without nutritional supplements? Kudos to the Clinton Health Access Initiative, the Children’s Investment Fund Foundation, Nutriset, the Government of Nigeria and UNICEF for the recent campaign in Kano State where children received nutritional supplements alongside their malaria medicines, protecting them against the double scourge of malaria and malnutrition at a particularly vulnerable time of the year. But when will the inclusion of nutrition in existing health outreach efforts among vulnerable populations be routine? The makers, distributors, advertisers and sellers of the vast majority of foods that people consume are not governments or non-profit organizations, but profit-seeking individuals and companies. Food is not medicine, and there is no health system standing between consumers and the food they regularly purchase for daily consumption in all but the most desperate of humanitarian settings. Not only do companies provide food, but they are also in steady dialogue with consumers through their marketing channels which are becoming ever more sophisticated with rapid income growth and urbanization occurring everywhere alongside rising consumption of processed foods. Other areas of global health (e.g. vaccines, malaria and HIV/AIDS) have made great strides by working closely with companies, whether it’s the pharmaceutical companies who make medicines or the large employers who are trying to protect the health of their workforces. It is even more important that the nutrition sector fully engage the companies who produce, market and sell food and who employ large populations in the countries struggling with malnutrition. The burgeoning SUN Business Network has emerged as the most promising platform for private sector engagement in nutrition and all stakeholders need to rally behind it. Initiatives like the Access to Nutrition Index also have the potential to shape the behavior of companies by publicly releasing corporate performance against 170 indicators – investors and consumers take note. 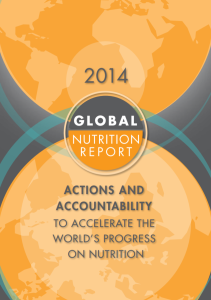 Let’s hope the 2015 Global Nutrition Report is able to include a much greater focus on how corporations can be brought to the nutrition negotiating table as full and equal partners. There is a quiet revolution underway in international development finance with the new Global Financing Facility under construction and due for launch in mid-2015. This Facility has to date mobilized $4 billion — an unprecedented amount of funding that country governments can access to achieve their reproductive, maternal, newborn, child and adolescent health goals. As a major contributing factor in maternal, newborn and child deaths, nutrition has a strong claim for investment but this will be dependent on how much country governments prioritize nutrition in their national health plans. Nutrition stakeholders need to roll up their sleeves and get to work in the countries with the largest nutrition challenges to make sure that nutrition is front and center of national health plans. Nutrition leaders should also mobilize any additional resources needed to create a dedicated “window” for nutrition money to flow from the Global Financing Facility to countries. If the Global Financing Facility is launched without a major focus on nutrition in 2015, it will be a major missed opportunity. The Global Nutrition Report calls for “National Nutrition Champions,” but the real champions of nutrition are the hundreds of millions of disempowered women who are responsible for feeding future generations under the most challenging of conditions. It is often these women, mostly mothers, who shoulder the burden of farming, shopping, cooking and feeding families when they themselves are often struggling with poor nutrition, low levels of education and severe restrictions in their ability to earn an income and make household decisions. So profound is the nutrition-gender nexus that recent work by Rohini Pande and Seema Jayachandran suggests that India’s preference for sons may actually explain the mysteriously higher levels of stunting among Indian children. This study revealed that first born children in India are actually taller than firstborn African children and that stunting emerges within Indian families only after the arrival of the first son. This suggests that India will never end child malnutrition without broader shifts in attitudes towards daughters. There is now a powerful political movement to advance the health of women and children led by the UN Secretary-General — the Every Woman, Every Child movement — and nutrition stakeholders need to plant their agenda for action firmly within the broader framework of women’s empowerment. If there is one major lesson from the Millennium Development Goals, it is that gains for women have been major drivers of progress in the countries that have met the goals. Improving the nutritional status of women will be a key ingredient for success in the Sustainable Development Goal era. China and the Republic of Korea. Bangladesh, Bolivia, Cambodia, Egypt, Eritrea, Ethiopia,Madagascar, Malawi, Mongolia, Nepal, Peru, Rwanda, and Uruguay.